The prestigious Grade II listed office building, overlooking the Thames on Victoria Embankment, underwent a full refurbishment with Structuretone the main contractor. Washroom Washroom, working alongside specialist commercial interiors contractor, Stortford Interiors, made its mark on the building by installing new washrooms on all levels in both the north and south blocks to a value of £620,000. Concerto bronze etched glass integrated duct panelling. Washroom Washroom installed three distinct washroom areas; reception area washrooms for staff and visitors, washrooms for staff on all floors and an executive washroom area on the sixth floor of the building, in addition to staff shower facilities installed in the basement. 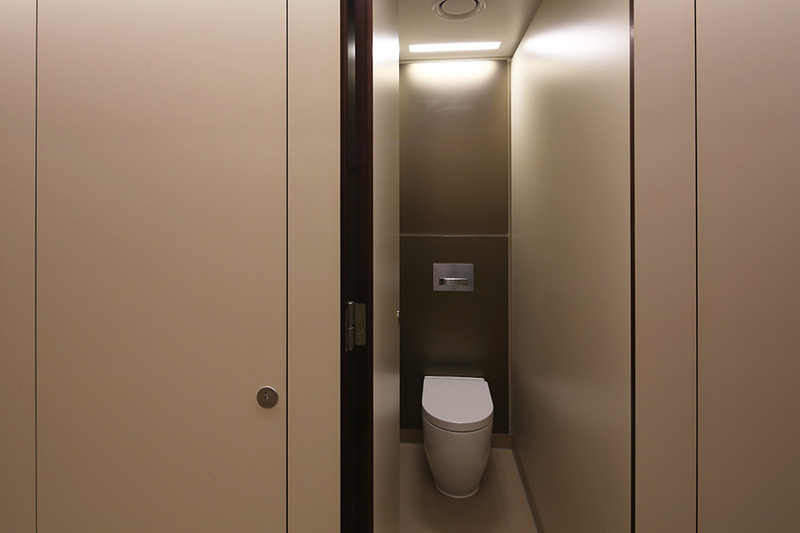 Each area demanded a unique finish within the same overall design style, so the creation of a mock-up for client approval by Washroom ensured all the different design elements came together perfectly. For the WCs and urinals, Washroom’s integrated duct panelling system, which as well as creating a sleek finish also has practical benefits, making future maintenance much easier, was installed. 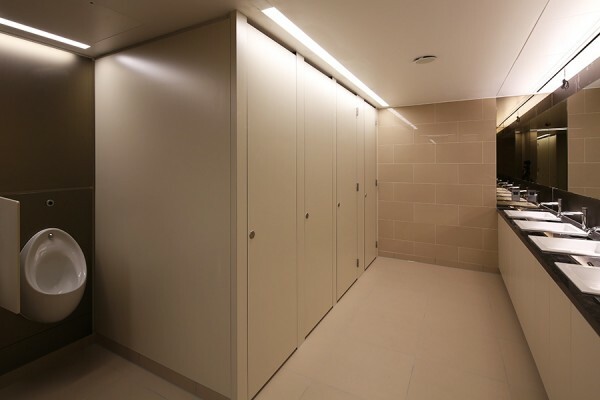 The bespoke system, which can be manufactured in a range of finishes, was specified in bronze acid etched glass throughout to create a striking look and high specification style, complementing the rest of the building. The vanities were manufactured from granite in the standard washrooms while marble was used in the executive washroom areas on the sixth floor. Both provide a durable, easy-to-clean yet stylish finish and were chosen to complement the different flooring and tiling fitted in each area. 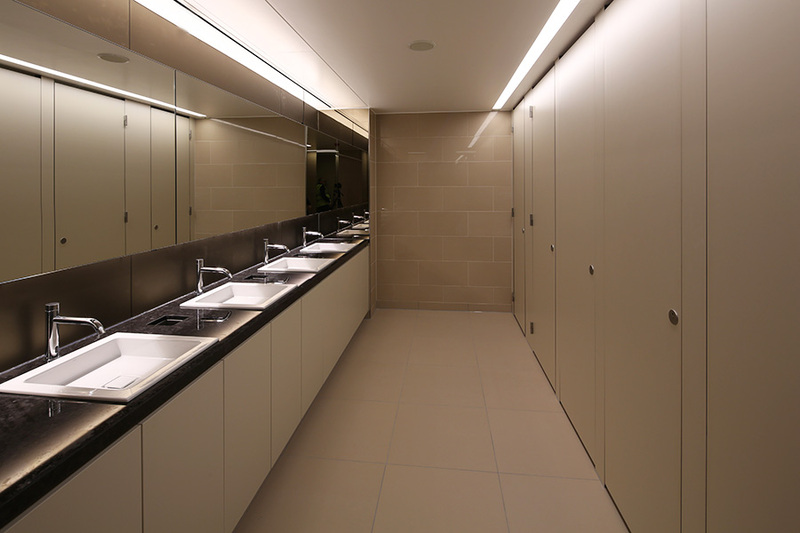 Concealed consumables, with hand soap and paper towel dispensers inset within the mirrors, were also a key feature of the washroom areas, with the mirror surrounds also manufactured in bronze acid etched glass to complement the integrated duct panelling system. 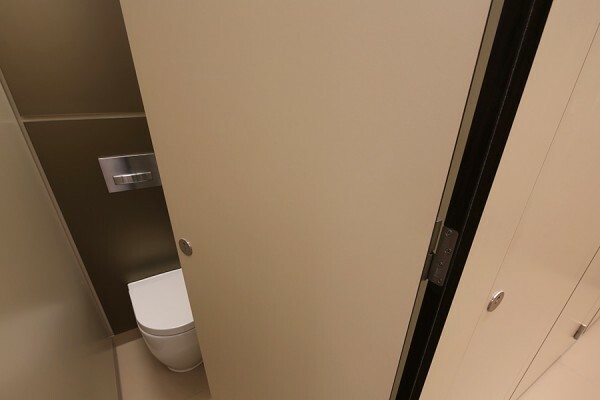 For the WC cubicle doors, Washroom’s premium quality Alto Laminate cubicles, which with full height floor to ceiling doors offer ultimate privacy for end users, were installed in a pumice stone colour finish to complement the floor tiling and vanity units.